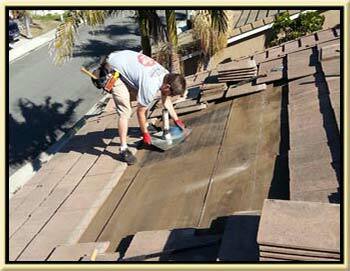 South County Roofing is your Aliso Viejo roof repair specialist. We have been repairing leaky roofs in Aliso Viejo for over 15 years now and we offer a 5 Year "No Roof Leak Warranty". Call us now for even quicker response hit the blue button on the top left corner of this page to fill out a contact form. If you have some broken roofing tiles that need to be repaired we can that for you. South County Roofing knows how to identify what type of roofing tiles are on your roof. We can match your roofing tiles as close as possible. It is very important when replacing broken roofing tiles that you get a decent match. If for any reason a good color match can't be had don't not worry. We will remove some of your existing tiles from an area of the roof that can't be seen and use those tiles for replacement of any highly visible tiles that we need to replace. If you have a wet spot or brown stain on your ceiling or wall there's a good chance your roof is leaking. We specialize in leak detection and roof leak repair. We accomplish this through a step by step process of finding the roof leak source and properly repairing it. 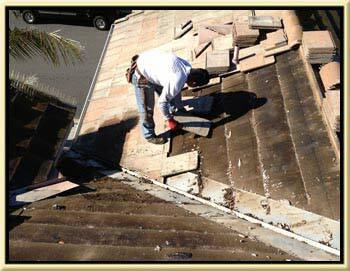 A roof leak repaired by Aliso Viejo Roof Repair should out last the whole rest of the roof. You will not have to repair the same area again a year or two later. South County Roofing and Roof Repair will issue you one of the industries longest and strongest roof repair warranties after we finish your roof leak repair. When getting your roof repaired you should be careful about purchasing a roof tune before having the roofer come out and take a look at the roof. Roofs typically have a lot more damage than what you can see from the ground. By not taking the time to have your roof properly looked at you may be opening up yourself for an expensive up sell. We do offer roof tune up specials but if you have more work to do than what we advertised we will let you know that before we start your job. Aliso Viejo Roofing is completely licensed, bonded, and insured. We have an excellent reputation, and you will love our people and our prices. Call now for a free roof repair estimate 92653, 92656, 92651, 92677.